This book is a critical analysis of religion in general and Islam in particular. It covers some common misconceptions about Islam that both Muslims and non-Muslims have. 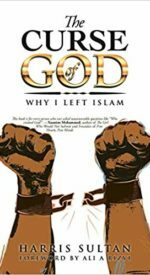 The book starts with a little introduction of the author, how and why he became an ex-Muslim and it is followed up with the importance of writing the book. The first chapter covers the importance of critical sense over common sense and how we should always invoke critical thinking when it comes to looking at the world around us. The book also covers some arguments for God and some counter arguments against God’s existence. It discusses the importance of God in keeping the morality of the society and the mental well being of the human species. It also discusses the baggage that comes with religion leaving our only lives here on planet Earth, devoid of pleasure and enjoyment. Moreover, it discusses the scientific flaws in the Quran and argues how it looks like a book written by a 7th century Arab warlord rather than the creator of the billions of galaxies. It discusses the critical and sensitive topic of the character of Allah (Muslim God) and Muhammad in light of the Quran, hadith (collection of Muhammad’s quotes) and the biography of Muhammad (written by early Muslim historians). It gives a detailed account of Muhammad’s wives and violence in his life. In the last part of the book, the author discusses the rise of Islamism in the western world and its dangers. Finally it educates its readers on how to debate with a religious apologist and some common arguments and techniques employed by them. It is a very interesting read into Islam from an ex-Muslim’s point of view and the best guide to learning Islam.